The critics would have us believe that Penn State dodged tough opponents this season. That simply isn’t true. For one thing, there are a number of tough opponents on the 2009 schedule (cue Russ Rose pointing out that every opponent is tough). Rich Kern’s Preseason Poll ranks Minnesota #8, Illinois #10, Michigan #16, St. Louis #17, Purdue #21, Wisconsin #34, Duke #36 (and picked #1 in the ACC Preseason Poll), and Michigan State #39. Granted, the PacTen has higher-rated teams, and more of them, but that’s hardly the fault of Penn State or Russ Rose. Rose believed Nebraska had agreed to play Penn State at University Park this season — a match that would have drawn enormous attention, given Penn State’s hard fought 3-2 victory over the Huskers in last year’s National Semi-Final match in Omaha, Nebraska. 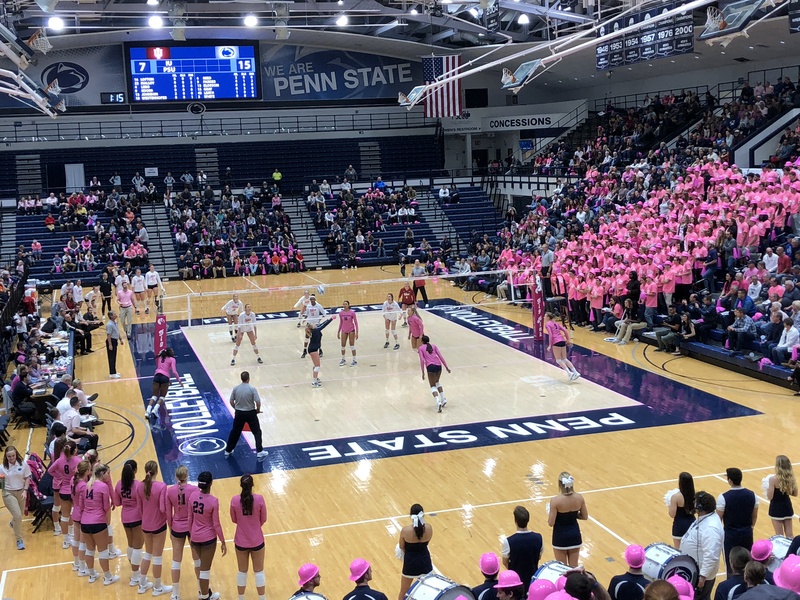 That match was a classic: largest crowd in NCAA Women’s Volleyball history, the only two sets Penn State lost all season. A natural, plus it would have been fair: Penn State has played Nebraska 12 times in Lincoln (plus last year’s “neutral” match in Omaha). Nebraska has played Penn State in University Park dozens of times once. For some reason, Nebraska chose not to come. It must be particularly galling to Rose to be criticized for participating in Saint Louis University’s Active Ankle Challenge in St. Louis, MO (against #17 St. Louis, Miami (OH), and Alabama) and at the Duke Invitational (versus Loyola, Md., College of Charleston, and ACC pre-season favorite Duke). Penn State had long-standing commitments to these events in return for visits to Penn State in recent seasons. The Durham trip has the added benefit that it is Megan Hodge’s hometown and close to Raleigh, Katie Kabbes’ hometown. We wish Stanford, Texas, Nebraska, Florida, Washington, etc., etc., etc. all had visited Univerity Park in 2009. With the Nebraska joining the Big10, at least Nebraska will in the future.